Left to itself art would have to be something very simple - it would be sufficient for it to be beautiful. But when it's useful it should spill out of just being beautiful and move over to other aspects of life so that when we're not with the art it has nevertheless influenced our actions or our responses. One from a series of fifteen color aquatints printed in three impressions each. Image size: 12 x 14" ; paper size: 12 x 14". Image size: 12 x 14"; paper size: 12 x 14". Color spit bite aquatint with sugar lift aquatint on smoked paper. Image size: 45 x 36"; paper size: 54 x 41". Edition 25. One in a series of 57 monotypes with branding on smoked paper. Image size: varies 17½–19¼ x 25¾–26¼"; paper size: varies 17½–19¼ x 25¾–26¼". One in a series of 57 unique prints with drypoint, aquatint, and hard and soft ground etching on smoked paper. Image size: 7½ x 8½"; paper size: 7½ x 8½". One from a series of 37 unique prints; drypoint, spit bite and sugar lift aquatints with soft ground etching on smoked paper. Image size: 15½ x 20"; paper size: 15½ x 20". Image size: 11 x 15"; paper size: 18¼ x 23". Edition 25. Aquatint on two sheets of brown smoked paper. Image size: 38½ x 26½"; paper size: 38½ x 26½". Edition 15. Aquatint on two sheets of gray smoked paper. Image size: 35½ x 26"; paper size: 35½ x 26". Edition 15. Color spit bite and sugar lift aquatints on smoked paper. Image size: 8 x 14"; paper size: 18¼ x 23". Edition 20. Image size: 14 x 16"; paper size: 23 x 18¼". Edition 20. Image size: 8 x 14½"; paper size: 18¼ x 23". Edition 20. From a series of 48 unique color aquatints with flat bite etching. Image size: 17 x 24"; paper size: 22¾ x 30". Image size: 17 x 24"; paper size: 22¾ x 30" . One from a series of 45 unique color aquatints with flat bite etching. Image size: 11 x 15¾"; paper size: 15¾ x 19". Number 9 from a series of 50 smoked paper monotypes with branding on gampi paper chine collé. Image size: 24½ x 18½"; paper size: 24½ x 18½". Number 11 from a series of 50 smoked paper monotypes with branding on gampi paper chine collé. Number 14 from a series of 50 smoked paper monotypes with branding on gampi paper chine collé. Number 17 from a series of 50 smoked paper monotypes with branding on gampi paper chine collé. Number 19 from a series of 50 smoked paper monotypes with branding on gampi paper chine collé. Number 24 from a series of 50 smoked paper monotypes with branding on gampi paper chine collé. Number 25 from a series of 50 smoked paper monotypes with branding on gampi paper chine collé. Number 26 from a series of 50 smoked paper monotypes with branding on gampi paper chine collé. Number 28 from a series of 50 smoked paper monotypes with branding on gampi paper chine collé. Number 30 from a series of 50 smoked paper monotypes with branding on gampi paper chine collé. Number 35 from a series of 50 smoked paper monotypes with branding on gampi paper chine collé. Number 37 from a series of 50 smoked paper monotypes with branding on gampi paper chine collé. Number 42 from a series of 50 smoked paper monotypes with branding on gampi paper chine collé. Number 49 from a series of 50 smoked paper monotypes with branding on gampi paper chine collé. One from a series of 50 smoked paper monotypes with branding on gampi paper chine collé. Image size: 20 x 11½"; paper size: 20 x 11½". Number 4 from a set of 13 color drypoints. Image size: 18 x 24"; paper size: 18 x 24". Edition 10. Number 6 from a set of 13 color drypoints. Number 8 from a set of 13 color drypoints. Image size: 7 x 21½; paper size: 9¼ x 23¼. Edition 25. Published by Crown and printed by Lilah Toland. Image size: 7 x 21½"; paper size: 9¼ x 23¼. Edition 25. Image size: 18¾ x 10"; paper size: 26½ x 16". Edition 25. Image size: 7 x 21½"; paper size: 9¼ x 23¼". Edition 25. #2 from a series of 36 color monotype collagraphs. Image size: 11¾ x 18½"; paper size: 11¾ x 18½". #11 from a series of 36 color monotype collagraphs. Number 1 from a series of 38 related color etchings with aquatint, engraving, photoetching and drypoint. Image size: 14 x 18"; paper size: 14 x 18". Number 2 from a series of 38 related color etchings with aquatint, engraving, photoetching and drypoint. Number 3 from a series of 38 related color etchings with aquatint, engraving, photoetching and drypoint. Number 4 from a series of 38 related color etchings with aquatint, engraving, photoetching and drypoint. Number 5 from a series of 38 related color etchings with aquatint, engraving, photoetching and drypoint. Number 6 from a series of 38 related color etchings with aquatint, engraving, photoetching and drypoint. Number 7 from a series of 38 related color etchings with aquatint, engraving, photoetching and drypoint. Number 8 from a series of 38 related color etchings with aquatint, engraving, photoetching and drypoint. Number 9 from a series of 38 related color etchings with aquatint, engraving, photoetching and drypoint. Number 10 from a series of 38 related color etchings with aquatint, engraving, photoetching and drypoint. Number 11 from a series of 38 related color etchings with aquatint, engraving, photoetching and drypoint. Number 12 from a series of 38 related color etchings with aquatint, engraving, photoetching and drypoint. Number 13 from a series of 38 related color etchings with aquatint, engraving, photoetching and drypoint. Number 14 from a series of 38 related color etchings with aquatint, engraving, photoetching and drypoint. Number 15 from a series of 38 related color etchings with aquatint, engraving, photoetching and drypoint. Number 16 from a series of 38 related color etchings with aquatint, engraving, photoetching and drypoint. Number 17 from a series of 38 related color etchings with aquatint, engraving, photoetching and drypoint. Number 18 from a series of 38 related color etchings with aquatint, engraving, photoetching and drypoint. Number 19 from a series of 38 related color etchings with aquatint, engraving, photoetching and drypoint. Number 20 from a series of 38 related color etchings with aquatint, engraving, photoetching and drypoint. Number 21 from a series of 38 related color etchings with aquatint, engraving, photoetching and drypoint. Number 22 from a series of 38 related color etchings with aquatint, engraving, photoetching and drypoint. Number 23 from a series of 38 related color etchings with aquatint, engraving, photoetching and drypoint. Image size: 11; paper size: 12 x 14". Number 24 from a series of 38 related color etchings with aquatint, engraving, photoetching and drypoint. Number 25 from a series of 38 related color etchings with aquatint, engraving, photoetching and drypoint. Number 26 from a series of 38 related color etchings with aquatint, engraving, photoetching and drypoint. Number 27 from a series of 38 related color etchings with aquatint, engraving, photoetching and drypoint. Number 28 from a series of 38 related color etchings with aquatint, engraving, photoetching and drypoint. Number 29 from a series of 35 related color etchings with photoetching, engraving and drypoint in two impressions each. Number 30 from a series of 38 related color etchings with aquatint, engraving, photoetching and drypoint. Number 31 from a series of 38 related color etchings with aquatint, engraving, photoetching and drypoint. Number 32 from a series of 38 related color etchings with aquatint, engraving, photoetching and drypoint. Number 33 from a series of 38 related color etchings with aquatint, engraving, photoetching and drypoint. Number 34 from a series of 38 related color etchings with aquatint, engraving, photoetching and drypoint. Number 35 from a series of 38 related color etchings with aquatint, engraving, photoetching and drypoint. Number 36 from a series of 38 related color etchings with aquatint, engraving, photoetching and drypoint. Number 37 from a series of 38 related color etchings with aquatint, engraving, photoetching and drypoint. Number 38 from a series of 38 related color etchings with aquatint, engraving, photoetching and drypoint. Number 27 from a series of 35 related color etchings in two impressions each. Image size: 18½ x 24½"; paper size: 18½ x 24½". Number 29 from a series of 35 related color etchings in two impressions each. Number 4 from a series of 35 related color etchings with photoetching, engraving and drypoint in two impressions each. Image size: 11 x 22"; paper size: 11 x 22". Number 16 from a series of 35 related color etchings with photoetching, engraving and drypoint in two impressions each. Number 31 from a series of 35 related color etchings with photoetching, engraving and drypoint in two impressions each. Color photoetching; each print color unique. Image size: 22 x 28"; paper size: 24 x 36". Edition 25. Color hard ground and soft ground etching with drypoint, engraving and sugar lift aquatint. Image size: 13 x 18½"; paper size: 22 x 30". Edition 25. From a portfolio of seven color hard and soft ground etchings with sugar lift aquatints and photoetching. Image size: 5 x 3"; paper size: 12 x 17". Edition 25. Image size: 7 x 5¾"; paper size: 12 x 17". Edition 25. Image size: 10 x ¾"; paper size: 12 x 17". Edition 25. Image size: 7 x 2¼"; paper size: 12 x 17". Edition 25. Image size: 1¼ x 4¼"; paper size: 12 x 17". Edition 25. Image size: 1¼ x 2¾"; paper size: 12 x 17". Edition 25. Image size: 1½ x 6¾"; paper size: 12 x 17". Edition 25. Unique framed color etching, cancelled copper plates and 1 to 5 working drawings by the artist. Image size: 8 x 12"; paper size: 13 x 20". Edition 25. In 1988 and 1989 John Cage delivered the Charles Eliot Norton Lectures at Harvard University, and the accompanying book (Harvard University Press) describes Cage in this way: “Without doubt the most in influential American composer of the last half century, John Cage has had an enormous impact not only on music but on art, literature, the performing arts, and aesthetic thought in general. His insistent exploration of ‘nonintention’ and his fruitful merging of Western and Eastern traditions have made him a powerful force in the world of the avant-garde.” Cage was born in Los Angeles in 1912 and died in New York City in 1992, less than a month before his eightieth birthday. After graduating from Los Angeles High School, Cage spent two years at Pomona College, then six months traveling in Europe writing poetry and painting. Back in Los Angeles in the Depression years, he went door to door offering lectures on art and music to support his study of music composition. In 1934–36 he studied with composer Arnold Schoenberg, who persuaded him to give up painting in favor of music. Cage moved to New York City in 1942 and a year later presented a concert of percussion music at the Museum of Modern Art. He delivered the famous “Lecture on Nothing” in 1950 at the Artist’s Club, which was frequented by abstract expressionists. He was friendly with dancer Merce Cunningham and artists Jasper Johns and Robert Rauschenberg, and the work of each of the four was influenced by the others. In 1951 Cage began composing music based on chance operations using the I Ching (Chinese Book of Changes) and in 1952 presented his most famous music composition, 4’33”, in which the performer sits quietly for four minutes and thirty-three seconds. The music heard by the audience consisted solely of ambient sound. Beginning in 1964, when the New York Philharmonic performed his Atlas Eclipticalis, Cage’s music works have been performed by great orchestras around the world. Beginning in 1961, when Wesleyan University Press released his Silence, an anthology of lectures and poetry, his writings have been published and republished. Cage’s body of work in visual art consists mainly of works on paper. At Crown Point Press, he created etchings and monotypes over a period of fifteen years beginning in 1978. Starting in 1983, he made drawings on paper, and in two sessions at the Mountain Lake Workshop in Virginia, in 1988 and 1990, he produced watercolors, some very large. He also worked in lithography and with handmade paper, and designed several complex room-sized exhibitions, one for the Carnegie International in Pittsburgh in 1991. A 1992 survey of his visual art was held at the Museum of Contemporary Art, Los Angeles, and solo shows have been at the California Palace of the Legion of Honor in San Francisco (2000), the Phillips Collection in Washington, DC (1987), the Whitney Museum of American Art in New York (1982), and the Museum Folkwang in Essen, Germany (1978), among many other museums. His prints, drawings, and watercolors are in the collections of major museums, including the Museum of Modern Art in New York, the Stedelijk Museum in Amsterdam, and the Frankfurter Kunstverein in Frankfurt, Germany. His visual art is represented by the Margarete Roeder Gallery in New York. A film in four parts by Kathan Brown. This film is composed of vintage video clips of John Cage at work in the etching studio of Crown Point Press, in San Francisco. It begins with Cage's first etching project there, in 1978, and ends with his last one in 1992, the year he died. The film is separated into four parts, and each part is named for a material Cage used as a starting point, and each part focuses on the making of a series of prints. 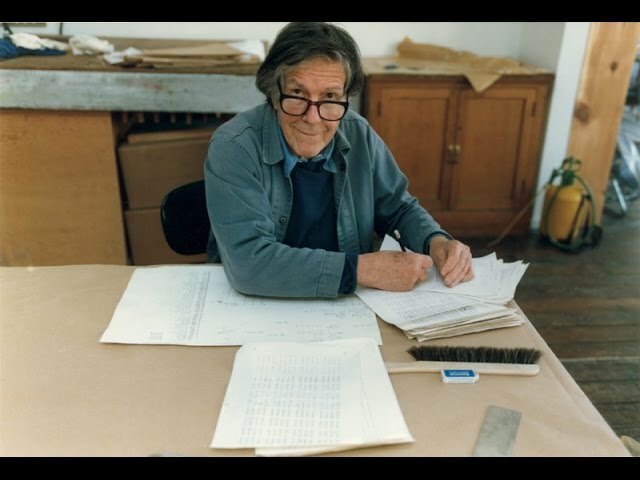 John Cage's approach to music, writing, visual art, and life was one of-a-piece, and in this film he demonstrates that approach, and describes it in his own voice. 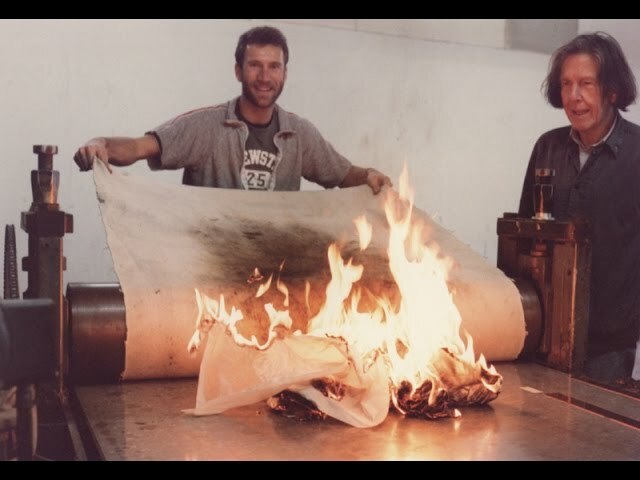 Composer and artist John Cage uses fire to create an etching at Crown Point Press in San Francisco, 1986.